Explore the beautiful Smoky Mountains while staying at one of these unique country inns, hotels and lodges. Enjoy a variety of fun vacation activities, from hiking and canoeing to exploring the local sights and shopping. Choose from romantic rooms and suites with fireplaces, Jacuzzis and private balconies to make your trip even more memorable. 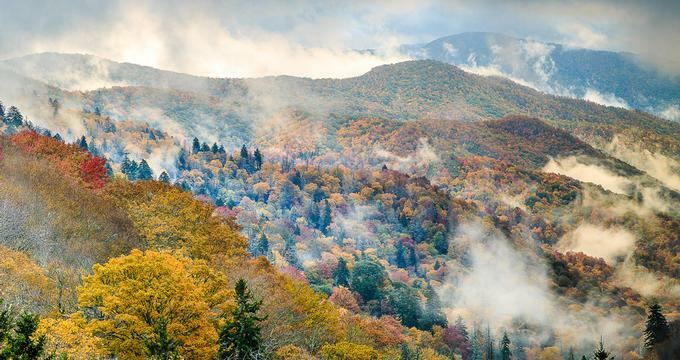 Here are the best Smoky Mountain getaways. Berry Springs Lodge is a romantic, secluded bed and breakfast located at the foothills of the Smoky Mountains and surrounded by tranquil landscaped grounds and miles of unspoiled nature. The huge stone and pine beamed living space has large windows overlooking the mountains, and each of the nine guest rooms and two suites has unique and individual décor and color schemes. The Tudor Inn Gatlinburg looks like it belongs in medieval England with turrets, coats of arms, and other Tudor-inspired details, but this family-owned bed and breakfast is an authentic Smoky Mountain country inn. Situated in the center of Gatlinburg near all the action but secluded in surroundings of greenery and tall trees, the inn is only a short drive from Great Smoky Mountains National Park. Guests can socialize in the comfortably furnished living room with a fireplace or in the bright sunroom. Five spacious guest rooms are comfortable and feature a king or queen sized bed and a convertible sofa, private bathrooms, fine linens, free Wi-Fi, and 32 inch HDTVs. The guests are invited to start their day with a delicious homemade three-course breakfast. Laurel Springs Lodge, established in 1930, is a historic, meticulously renovated bed and breakfast in the heart of Gatlinburg, a short walk to the Sweet Fanny Adams Theatre, the nearest Trolley stop and the Convention Center and only three miles from the outdoor action of the Smoky Mountain National Park. Five charming, very comfortable rooms have private bathrooms, fridges, flat-screen TVs, DVD players and free Wi-Fi. Some feature electric fireplaces. Guests are invited to enjoy a comfortable living room with a large stone fireplace, a hot tub on the patio, and a lovely gazebo with chairs and hammocks. Complimentary drinks, desserts, and snacks are offered in the afternoon and evening. 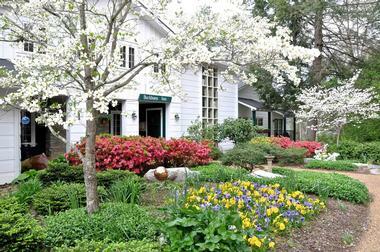 Historic home lovers will love the Albemarle Inn. A fully restored 1909 Greek Revival, this bed and breakfast is located in the historic Grove Park District of Asheville. Just two miles outside of downtown Asheville, the inn is strategically placed for visits to downtown shopping and restaurants as well as trips to the Biltmore Estate, Blue Ridge Parkway, and the national parks. Stonebrook Lodge is a new hotel located in Cherokee, North Carolina. Surrounded by the Great Smoky Mountains National Park just off the Blue Ridge Parkway and close to Gatlinburg, Tennessee, this hotel is in a great spot for a mountain getaway. The lodge is also located directly across from Harrah’s Cherokee Casino and Event Center. A complimentary continental breakfast is included in the room rate, and guests are also provided with complimentary Wi-Fi throughout the lodge, as well as in-room coffee makers and refrigerators. Rooms with jetted tubs and microwaves are also available. Opportunities for education on Cherokee tribe culture and history are plentiful in the local area. Christopher Place is a magnificent, newly constructed, colonial-style mansion sitting on 200 acres of manicured lawns and woods, surrounded by spectacular wilderness of Smoky Mountains. Romantic and luxurious, it is the perfect getaway and refuge from daily stress. 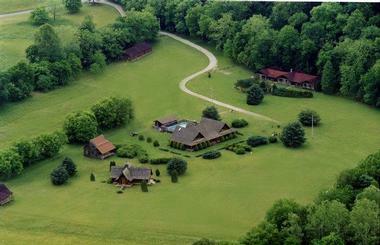 The property is secluded but located only about six miles from Newport. The hotel’s nine unique elegant rooms have designer furnishings, latest flat-screen TVs, and private bathrooms. Some feature fireplaces, cozy sitting areas, and whirlpool tubs. Guests are invited to socialize in the hotel’s beautiful wood-paneled library, which has a bar and a billiard room. The outside veranda is furnished with comfortable rocking chairs. The inn also has an exercise room, an outdoor pool, and a gourmet restaurant. More ideas: 15 Best Things to Do in Asheville, North Carolina. Blue Mountain Mist is a charming 10,000-square-foot Victorian-style farmhouse sitting on sixty green acres in the foothills of the unspoiled Smoky Mountains. A short drive from Gatlinburg, this lovely bed and breakfast offers twelve guest rooms and five private, romantic cottages. All rooms feature amenities such as oversized bed-side Jacuzzis, cozy sitting areas, fireplaces, antique furniture, heirloom quilts, original artwork, historic photos, and much more. Beautiful views from the rooms, cottages, or wraparound porch only add to the romance of the place. Guests staying in the main house will wake up to the delightful smell of a home cooked Southern breakfast. As an alternative to the large hotels primarily located in the town of Gatlinburg, Mountain Vista Luxury Rentals provides visitors the opportunity to get away from the hustle and bustle and enjoy the natural serenity of the Smoky Mountains. With a large selection of private homes to choose from, guests may find themselves staying in anything from an executive mansion to a cozy cabin. The numerous choices mean a wide variety of amenities are available, including gourmet kitchens, outdoor hot tubs, wood burning fireplaces, mountain views, covered balconies and patios, fire pits, and barbeques. Never more than a short drive into town, these rentals are an excellent way to maximize the experience of Gatlinburg. Just outside historic downtown Asheville, the 1889 WhiteGate Inn and Cottage is a luxurious and inviting bed and breakfast. With eleven guest rooms uniquely decorated and honoring distinguished poets, this inn provides guests with an opportunity to mix a love of poetry and all the pleasures of Asheville. Each room is chock full of 5-star quality amenities, and most include a fireplace and jetted tub. Breakfast is a 3-course, chef prepared affair that includes delights such as eggs baked in a cheese basil béchamel and oatmeal custard crème brûlée. Special packages and in-room spa treatments are available. More places to stay: The Lodge at Buckberry Creek and Deer Ridge Mountain Resort in Gatlinburg, Tennessee. High up in the mountains only about six miles from the Great Smoky Mountains National Park, the Richmont Inn is designed in the traditional style of an Appalachian barn. Rustic and romantic, it offers luxurious accommodation and art-filled rooms in the main building and new adjacent chalet. All rooms are uniquely decorated and have private bathrooms, free Wi-Fi, and coffeemakers. Many rooms have fireplaces and fridges, and some have spa tubs and balconies. There is a spectacular view from all rooms instead of TVs. All guests are offered a full "sit down and enjoy" gourmet breakfast each day, as well as coffee and home-made desserts by candlelight in the evening. Located at the mouth of Smoky Mountain National Park, The Bearskin Lodge on the River boasts a perfect setting where guests can enjoy all the area has to offer. With large, comfortable, and clean rooms complete with Temperpedic type mattresses, this hotel provides its guests with a lovely retreat. Many rooms come with balconies overlooking the river and jetted tubs. Other amenities include complimentary continental breakfast, refrigerators, coffee makers, and gas fireplaces. Hot coffee is available all day in the lobby, as well as cookies and lemonade in the afternoon. An hour southwest of Asheville, North Carolina on the shores of the Tuckasegee River sits The Dillsboro Inn. This inn has been in operation for over 30 years and is a quaint 8-room retreat. The stars of this property are the gardens and riverfront where guests can sit and enjoy the splendor of both the Blue Ridge and Smoky mountains. Each of the eight rooms is a unique suite and all face the shore of the river. Amenities of the property include a riverside hot tub, yoga room, and mineral bath. Special occasion packages are available. The 1900 Inn on Montford sits in the heart of Asheville’s Montford Historic District. The stylish and elegant inn is designed in an Arts and Crafts style and is furnished with antiques from as far back as 1730. The eight rooms and suites at the 1900 Inn all have king-sized beds, whirlpool tubs, showers, and fireplaces. Each bathroom is unique and notable. Rates include a three-course breakfast with fruit, a savory egg dish, and dessert. For guests looking for a bit more decadence, the Cloisters suite spans the entire 2nd floor of a carriage house and is perfect for guests traveling with a pet. 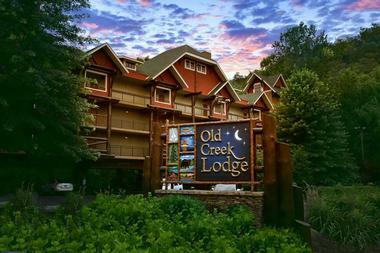 A stay at Old Creek Lodge puts visitors in a cozy and luxurious environment while bringing them close to all the attractions of Gatlinburg. Comfortable, high quality, and affordable, the lodge provides high-end amenities, such as a deluxe continental breakfast, in-room gas fireplaces, complimentary Wi-Fi, and private balconies overlooking a beautiful stream. Rooms are large and bright and decorated in a rustic, yet elegant fashion. The property also features an outdoor heated pool. Located in the village of Gatlinburg, the lodge is within walking distance of the shops, restaurants, and attractions of the main strip. 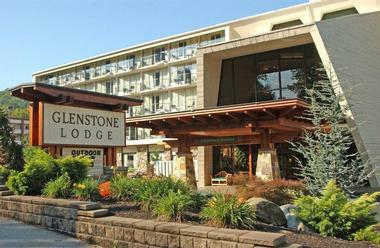 With both an outdoor and spectacular indoor pool, the Glenstone Lodge is a family-friendly hotel ready to help organize guests’ visits to Gatlinburg. The hotel offers numerous pre-planned packages to assist in getting the most out of your vacation. Whether it is a visit to the award winning Ripley Aquarium, an adventurous white water rafting trip, or zooming through the treetops with a zipline tour, the staff at Glenstone stands ready to help. With over 200 rooms, this hotel can meet any accommodation need. The location is great for exploring the downtown area, and a breakfast buffet is available to guests each morning. Set on 40 acres of well-tended grounds and wild forests on the banks of a fast running mountain creek, Creekwalk Inn and Cabins is classically romantic, rustic, and charming with cathedral ceilings and hand-made furniture. Overlooking the creek or the surrounding forest, the seven rooms have private bathrooms and all the comforts of home. Some have a cozy sitting area, a fireplace, and a Jacuzzi. 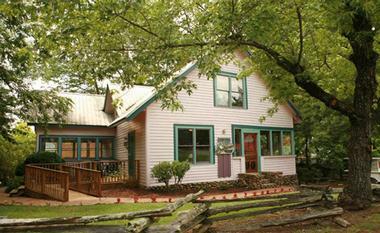 Quaint cabins are tucked away in the forest and offer total privacy and a porch for quiet relaxation and bird watching. A hot locally sourced multi-course homemade breakfast is served in the inn’s cozy dining room. There's an on-site chapel and space for events. In the heart of Pigeon Forge hidden off the beaten track and surrounded by the ancient Smoky Mountain forests, Smokie’s Bed and Breakfast is an intimate refuge where luxury meets rustic charm. Step back in time in the historic inn where accommodations feature whirlpool tubs and wood burning fireplaces and breakfast is served in your room if you so desire. While the main inn and its cozy, beautifully decorated rooms are in town, there are three cabins in the woods offering total privacy and true romance under the stars. And when you feel the need for some socializing, hop over to Patriot Park for a concert or event or take the trolley to all the fun at Dollywood. More ideas: 10 Best Things to Do in Pigeon Forge, Tennessee. Buckhorn Inn has been welcoming guests to Gatlinburg since 1938. A classic, beautifully decorated country inn, the Buckhorn offers elegance and charm at the foot of the Great Smoky Mountains, close to all Gatlinburg shops, theatres, and galleries, and opportunities for exploring the great outdoors in the Smoky Mountains. Surrounded by hemlock and pine forest and meadows covered in wildflowers, the Inn offers romance and comfort in a range of accommodations that would fit any demands. The main building has six standard and three premier rooms lovingly furnished with period antiques and local artwork. Seven spacious private cottages located just around the corner from the inn have living rooms and fireplaces and are surrounded by lush woodlands. Three fully equipped guesthouses offer total privacy and comfort. The inn’s own restaurant offers delicious free breakfasts. It is open for lunch and dinner for outside guests as well. 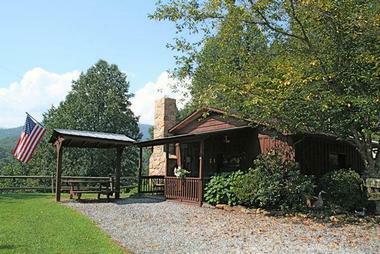 Visitors to the Western Carolina Mountains will find a great choice for accommodations at Sunset Farm Cabins. Guests can choose from one of seven clean private cabins of varying sizes with all the necessary amenities. All cabins have full kitchens with a refrigerator, stove, cook top, cookware, microwave, and utensils, and beds that are either queen sized or king sized. Each cabin has an indoor dining table and an outdoor private picnic table under a covered patio, and a charcoal grill is also available. Guests will also enjoy the huge fire pit, hot tub, and lawn games on the expansive surrounding property. More vacation ideas: The Swag Country Inn, Blackberry Farm, Eagles Ridge Resort and the Inn on Biltmore Estate.